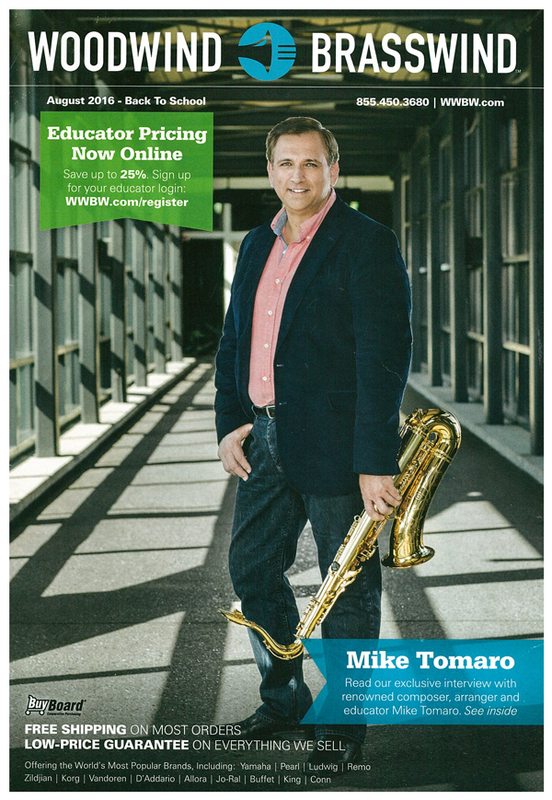 Mike Tomaro, Program Director of Jazz Studies, has been featured in the recent ‘Back To School' edition of the Woodwind/Brasswind catalog. Included in this issue is an interview with Professor Tomaro, surveying his educational background, arrangements, endorsements, and his working relationship with the Hal Leonard Corporation. The full interview, as well as a collection of Tomaro's work and supplementary recordings, can be found by visiting Woodwind/Brasswind online at www.wwbw.com/tomaro. Beginning in September, Tomaro will also serve as artistic director for a brand-new jazz concert series on Duquesne's Campus. Called the "Uptown Jazz Series," each of the six Monday-night concerts will feature local professional jazz groups, beginning with The Pittsburgh Jazz Orchestra Little Big Band on Monday, September 12, which Tomaro also directs. For more information about these concerts and all other School of Music Concerts, please visit duq.edu/musicevents. Tomaro has been the Director of Jazz Studies at Duquesne University in Pittsburgh, PA since 1997. Prior to his appointment at Duquesne, he lived in the Washington, D.C. area for seventeen years as a member of the Army Blues Jazz Ensemble, a unit of the prestigious "Pershing's Own" U.S. Army Band. While a member of this group, he served as its Enlisted Musical Director and performed for Presidents Reagan, Bush and Clinton as well as heads of state from around the world. He also composed and/or arranged much of the Army Blues repertoire and was featured as a soloist on several of the group's albums and CDs. Mike is a Yamaha Performing Artist and endorses Vandoren reeds, mouthpieces and ligatures exclusively. Mike has four nationally released recordings under his own name that showcase his talents as both performer and writer Forgotten Dreams (Seabreeze Jazz), Dancing Eyes (Seabreeze Jazz), and Home Again (Positive Music). His latest CD, Nightowl Suite (Seabreeze Jazz), features his compositions and arrangements as performed by the Three Rivers Jazz Orchestra, a group that he co-founded. Additionally, Mike has also been featured on many other CDs as performer and/or arranger, most notably on Nancy Wilson's last two Grammy Award winning releases, Turned To Blue and RSVP, ‘the New York Voices', ‘A Day Like This', Sheryl Bailey's ‘A New Promise' and the 21st Century Swing Band's ‘Pittsburgh Jazz Legacy' all on the MCG Jazz label. On the last two releases, Mike is prominently featured as the main arranger as well as a soloist. In his hometown, he is a member of the Pittsburgh Jazz Legacy Band, and has performed with guitarist Joe Negri, Pittsburgh Symphony, River City Brass Band, Pittsburgh Ballet and Pittsburgh New Music Ensemble in addition to leading his own small groups and the aforementioned Three Rivers Jazz Orchestra. He is also a member and co-artistic director (with trumpeter Sean Jones) of the newly formed Pittsburgh Jazz Orchestra. Additionally, Mike has co-authored the textbook Instrumental Jazz Arranging: A Comprehensive and Practical Guide (Hal Leonard Publications), with his long-time mentor, Dr. John Wilson, who was Director of Jazz Studies at Duquesne University from 1972-1996. Mike was associated for many years with the now defunct International Association for Jazz Education and is currently affiliated with the American Society of Composers, Authors and Publishers where he has received an ASCAP Plus award for the past eight years, the National Academy of Recording Arts and Sciences, Music Educators National Conference and the newly formed Jazz Education Network. Mike is in great demand both nationally and internationally as a guest soloist, adjudicator, and clinician.